I noticed my prints coming out bad and realized my side fans had stopped working. I reset my UM2 to factory settings and reset Cura settings as well. This did not help, so I ordered new fans. I have installed my new fans and they are not working either. If I set the fan speed to 50% on my UM2 and blow on them to get them started turning, they will keep spinning, just at a very low speed, so I think they are getting a little power. Also, I normally do not print with my LED lights on but noticed today that they are not working either. If I have the LED settings at 100%, they have a very low (like 5%) light output, so they seem to be getting some power too, but maybe not enough? I am worried there might be a problem with the control board, but I am not sure what to do from here. I have taken the bottom panel off to look at the connections and they are good. Any ideas? Thanks. Sounds like your 24V is bad. Try unplugging the power supply for an hour - it really takes that long (sometimes a few days!) for it to completely power down - you can tell because that little blue led stays on for a long time. Then plug it all back together and see if your LED's are brighter. it's also possible that your eeprom settings are messed up - in there it sets the scale factor for you filament chosen and your led brightness. You can do a "reset to factory settings" and it will reset all those values but you will also lose your "odometer" reading so you might want to check how many hours you ahve printed first and write that down. I don't think it's eeprom settings though - you can check under your filament settings to see what the fan multiplier is - for PLA it should be 100%. 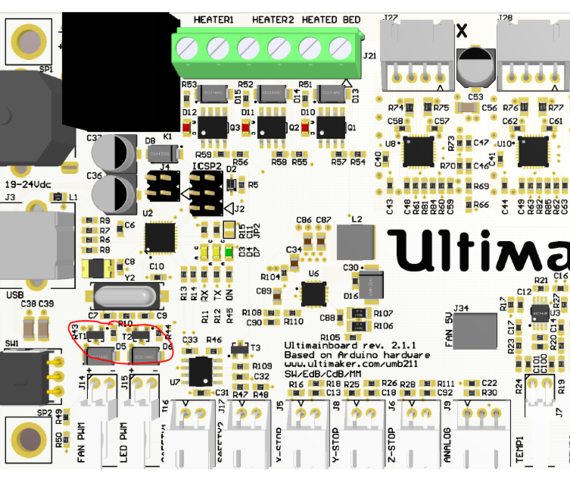 You can get the board layout and schematic of the UM2 here - I would check the voltage going in and out of K1. K1 may be defective and lowering the voltage when the heated bed is on. If 24V is good your heated bed should get from 20C to 60C in about 2 minutes. So you can test that also - if it takes say 10 minutes then it's not 24V. It's something less. It's much more likely your power brick is bad than anything on the white board, but again, K1 is the first place to check. Well actually, my heated bed has started to take longer to heat too. More like 10 minutes than 2. So how can I check the K1? Do you have a volt meter? You want to measure the voltage coming into the UM2. Did you try powering off the brick for an hour or longer? That brick has a computer in it and it can get in a bad state but it takes hours or days to reboot it because the brick holds so much power for so long. To make things clearer - even if your printer is off for an hour the brick is still plugged in and powerd up. You need to unplug it for a VERY long time for it to reboot. I unplugged everything when I got home from school - from my printer, from the wall. It took about 30 minutes for the blue light to go away but I left it unplugged for about an hour like you said. Then I plugged it all back in and the fans are still not coming on. But if I blow on the fans and give them a little boost, they will spin slow. Then if I put the fan % to 100% they still go slow but if I put the fan % to 0% they actually go faster (about 50%). Very odd. The LED's do sort of the same thing. If I put them to 100% they are very dim, like about 5%. But if I put them to 0% they actually get a bit brighter, maybe 10%. Also very odd. I am mainly worried about the fans since I cannot really print without them. My dad just gave me a 'multimeter'. Will that work to test the voltage? I can try leaving the power brick unplugged overnight tonight and maybe that will help to reset it? Oh, and I timed the build plate heat time and it only took 4 minutes to heat up from cold. Not 10 like I thought. Is that about right? Mine takes 4.5 minutes. So power supply is fine. No need to power it down over night. 0% they are brighter? 0% fan is faster? what the hell? I go look at schematic. The only thing I can think of is that they loaded the wrong parts into T1 and T2. But then your printer would have always been this way - is that possible? They should be labelled BC817. You have to remove all 4 screws (make sure power is off) that hold the board in and then flip it over. T1 and T2 are on the left edge - you need powerful reading glasses or a magnifying glass to read the labels on those. T3 is supposed to be BC807. If the guy who loaded the pick and place machine put the BC807 parts in the wrong slot then it would mess up only the led lights and the fan and nothing else and would exhibit exactly the symptoms you have. It would be great if you can diagnose this. That way you can be a bit of a hero and explain an issue that many people will be having soon as I would guess 100 boards went out like this. But this is just a theory at this point. Also if that's your problem you should send the board right back - open a ticket at support.ultimaker.com and link to this thread. But make sure you have the wrong parts in T1, T2 first. I will definitely check the board as you mentioned above but it will have to be tomorrow when I get home from school. I will also try to take a video of the issues and post that for you to see. It's less than a year - send the white PCB back and get a new one. Those 2 transistors (T1 and T2) must be damaged - maybe through static electricity? I don't know - definitely go straight to support at this point. I can't think of anything else that would cause your symptoms but also have the heated bed working fine. Hey gr5, I just wanted to let you know that fabrc8 sent me the new board and since install I have been up and running again with no issues to the fans or the LED's. Thanks again for the help.